Spanning a sixteen-year relationship with Victoria’s Secret, Mouawad has once again showcased its exclusive masterpieces on the runway of this year’s Victoria’s Secret Fashion Show in Paris. Held in the City of Lights for the very first time, the world’s most famous fashion event was complemented by the 126-year-old brand’s show-stopping Masterpiece Collection. With VIPs, A-list celebrities, and icons of the fashion world present, Paris was the ideal stage for jewelry of this caliber to be revealed, as each and every piece is as mesmerizing and unforgettable as the city itself. The VS lingerie models, known as Angels, were adorned with one-of-a-kind Mouawad creations featuring only the finest diamonds and gemstones, which helped usher in a triumphant statement at this year’s show. “Each jewel from the collection was as gorgeous and awe-inspiring as the VS Angel wearing it,” said Pascal Mouawad, Co-Guardian of the Mouawad brand. The jewels which shined on this year’s glamorous runway were specifically selected to complement the intricate designs of the lingerie worn by each model. “We are so proud to be once again showing at the Fashion Show and have selected over $12 million worth of our most spectacular pieces for this year’s theme,” he added. Mouawad has been behind the inspired collaborations with Victoria’s Secret since 2001, when Heidi Klum wore the first Fantasy Bra named as Heavenly Star. 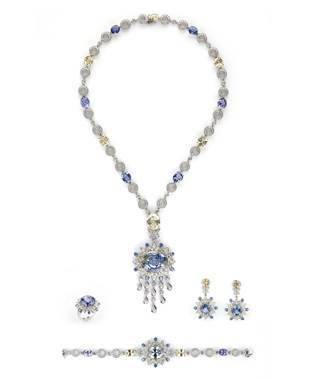 Mouawad’s exceptional jewelry collections have time and again rocked the fashion world, and this year’s offerings were no exception. The show will air on December 5th on the CBS television network.